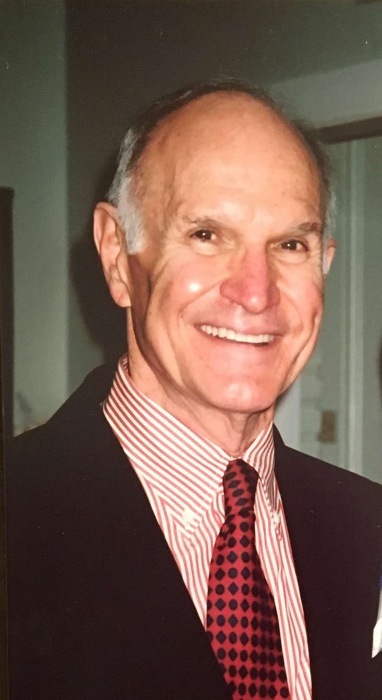 Fred Joseph Schubert, Jr. a father, husband, grandfather and consummate gentleman, passed away peacefully at home on January 24, 2019 after a courageous battle with Parkinson’s disease. He was born a fourth generation Houstonian on January 10, 1929 to Fred Joseph and Mabel Domingue Schubert and raised by his beloved paternal grandparents Fritz and Marjorie Smallwood Schubert. Fred showed an early propensity for scholarship and music. He graduated from Stephen F. Austin High School with highest honors at sixteen, and forged many lifelong friendships while there. He received his bachelor’s degree in music from the University of North Texas at age nineteen. Fred was a charter member of the university’s prestigious One O’Clock lab jazz band. Fred began working at the age of fifteen cultivating his musical talents. He played the alto saxophone, clarinet, and flute professionally. His musical career spanned the big band and World War II era, and he performed at establishments across Texas, predominantly in the Dallas and Fort Worth areas. After graduating college, Fred inspired a younger generation of musicians by teaching high school music and playing an integral role in the founding of his school’s band in DeKalb, Texas. Notably, many of Fred’s students pursued careers in music, and, grateful for his mentorship, kept in touch with him over the years and included him in their fiftieth reunion. In 1949, Fred married his college sweetheart Hulda Cannon of Vernon, Texas. The Schuberts raised two children and enjoyed a loving marriage—the model of a true Christian bond—for almost seventy years. Fred doted on his wife and children and lived a life of enduring faith as an active member of St. Luke’s United Methodist Church. After their children left home, the Schuberts became intrepid travelers, and built memories of once-in-a-lifetime adventures across the globe. After teaching, Fred began a career in the insurance industry. As in all other aspects of his life, he achieved success. Fred enjoyed a rewarding career at the Prudential Life Insurance Company, and his tremendous work ethic enabled him to serve in many leadership capacities. Fred served as president of the Houston Association of Life Underwriters, and sat on the board of the School of Insurance and Financial Services at the University of Houston. He received many industry honors including membership in the Million Dollar Round Table and Top of the Table. Possessed of an entrepreneurial spirit, Fred founded his own insurance agency and built a large book of loyal clientele who appreciated his competence, professionalism, and friendly nature. It was with pride that he worked alongside his son, Jack, to whom he left his business upon his retirement. Fred will be remembered for his quick wit, his ability to find humor in all circumstances, his encyclopedic knowledge of physics, history, and a plethora of other subjects. His intelligence, kindness, ease in conversation, appreciation for humanity, and ability to form meaningful connections with others made him a wonderful friend and mentor. Since Fred’s passing, his family has been comforted by the many friends who have offered condolences and shared stories of love and appreciation for him. Fred recently celebrated his ninetieth birthday with his family present, and all had the opportunity to tell him how much he was loved and to celebrate a life truly well-lived. Fred is survived by his wife of sixty-nine years, Hulda; his children Cynthia Poarch (Donald) and Jack Schubert (Jane Moran); his grandchildren Caroline Poarch, Allison Poarch (Fiance Thomas Coleman), Molly McDonald (William), and Jack Schubert, Jr., as well as many friends, acquaintances, and colleagues who cared for him deeply. Fred’s family wishes to extend gratitude to his wonderful caregivers, Wendy Bradford and Latifah Santos, for their love and devotion as well as the joy they brought to Fred’s life during his illness. The family also appreciates Fred’s medical providers, Dr. Glencora Sharfman and nurse Duane Jones. A memorial service will be held for Fred in the sanctuary at St. Luke’s United Methodist Church, located at 3471 Westheimer, on Friday, February 1 at eleven o’clock in the morning. A reception will follow in the Hines Baker Room. In lieu of flowers, please consider donating to the music ministry at St. Luke’s United Methodist Church or the Memorial Park Conservancy (7575 N Picnic Lane, Houston, Texas 77007).